Papa’s Games features a large selection of family-friendly flash games. All of these games have a food theme and feature Papa Loui. There are two major types of games found here, restaurant management games, where you cook and run your own restaurant, and side-scrolling adventure type games. We will look at both of these game types below. All of the games are also available on Android and Apple mobile devices. There is a wide variety of restaurant manage games. You can cook pizzas, wings, shusi, and bakery items to name a few. The flash game has cute graphics, and every game starts out with an amusing story. After the fame intro, it walks you through taking the first customers order and fixing their food. The tutorial is easy to follow. I also appreciate that after it shows you how to take care of the first customer the tutorial is over, and it allows you to jump into cooking. The game isn’t just a clicker. It is possible to make mistakes such as making a mess of dressing, overcooking food, or filling the batter pan too much. The game is also not so difficult that it would frustrate children that try to play. At the end of every shift of your restaurant, it grades you on how well you have managed to cook the food. The other type of game is a side-scroller type of game. In these games, you play as Papa Louie or one of his employes as they fight angry food that has magically become sentient. The characters also collect coins as they go to buy more items to help them on their quest. The controls are easy to remember and use. The graphics feature cute creatures such as an onion, burgers, and pizza monsters running around. It is not always one button push to defeat the bad guys, for example, the only way to hurt the pizzas is to throw their cheese back at them. The game like the restaurant games seems good at walking the line between too easy and frustratingly hard. Papas Games have fun games that everyone in the family can play. They are simple enough for children but challenging enough to keep an adult’s attention as well. Papa’s Games is a great family-friendly experience for anyone who loves restaurant style type games. There is a wide arrange of restaurants to choose from, from pizza to ice cream. The games run on flash and are easy and fun to play. Just follow the quick tutorials at the beginning of the game, and you will be cooking like a pro in no time. 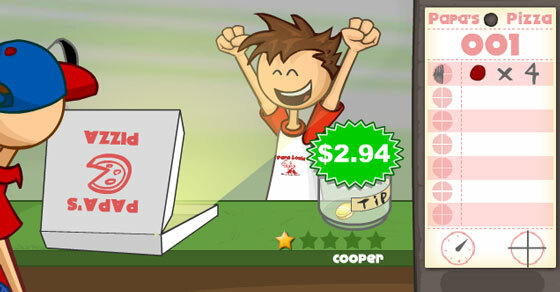 Tired of restaurant management games, kill the food instead with a fun side-scroller. Destroy killer pizzas, vegetables, hamburgers, and deserts, with your spatula and other cooking utensils. Tame the food, Save the world. No matter what you like, there is always something fun to play.